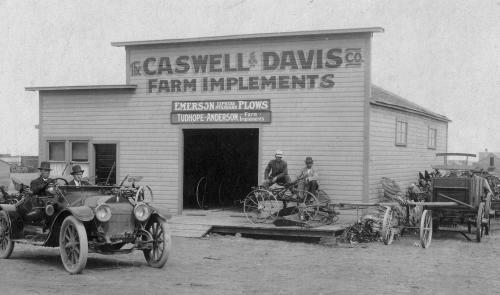 Assiniboia implement dealer, ca. 1913. As the machinery that shaped Saskatchewan agriculture was usually designed and manufactured outside of the Canadian prairie region, much of it, especially tillage equipment, was inferior and not suitable for local conditions and soil. The need for appropriate machine technology and equipment stimulated innovation and invention. The farm equipment industry was born in the 1930s, during the Dust Bowl and the Depression. However, owing to the lack of capital, infrastructure such as electricity, and farm income to purchase equipment, the manufacturing of farm equipment on the Prairies is mostly a post-World War II phenomenon. Saskatchewan's problem in attracting investment in manufacturing was due to several factors: the province was landlocked, had a small population, and was distant from the major North American markets; in addition, national economic and trade policies including Transportation and freight rates worked against prairie manufacturing. Canada had two full-line companies: Massey-Harris (later to become Massey-Harris-Ferguson, and finally Massey-Ferguson) and Cockshutt, both located in the Hamilton region of Ontario. The Massey Company at one time was the world's largest manufacturer of farm equipment; however, it fell on hard times and went into receivership in 1988. Most full-line companies were in financial trouble in the 1980s: one of the problems of the farm equipment industry is the cyclical nature of purchases, which tend to follow fluctuations in farm income. The short-line prairie companies had to operate within the framework of the full-line Canadian and American companies which had developed sales, distribution, parts, and credit systems. The prairie companies focused on tillage equipment, which was the least complex to manufacture; however, some manufacturers began to produce swathers as well as haying and feed processing equipment. There were only a few attempts at manufacturing farm equipment in Saskatchewan prior to World War II. The exceptions were farmers like the Hanson Brothers, who farmed near Regina and developed a swather in the mid-1920s. Their decision not to patent their invention provided a notable example of the problems with the patent: they were afraid that the likely court costs to defend their patent would bankrupt them as farmers. Their invention was picked up by IHC. Charles Noble in 1936 began to produce cultivators on his farm; in 1943 he established a factory at Nobleford, and by 1946 he had produced about 2,100 blade cultivators that became known as the Noble blade and were designed to leave the trash on the soil surface to reduce erosion. This equipment was developed for sound environmental reasons that would later dominate the approach to soil management. When Charles Noble died in 1957 his family carried on the business, which was sold to Versatile in 1972. In 1938 the Morris Rod Weeder Company at Yorkton began to manufacture the rod weeder, which like the Noble blade left the trash on the soil surface. In 1939 the Richardson Road Machinery Company in Saskatoon began to manufacture road equipment, and later rotary snow plows. Brandt Industries was formed in 1938 to offer welding and machine shop services; they first began to manufacture a wooden grain conveyer, followed by a grain auger, and then field sprayers and wind cones. It was after World War II that manufacturing on the prairies took off; Table AII-1 shows the extent of this growth. Manitoba always had the major share of manufacturing due to an available Labour force and being closer to steel. Saskatchewan saw notable growth, particularly after 1971 when it reached sales of $158 million in 1981. By comparison, Ontario had a value of shipments of $733 million in 1981. Farm equipment sales for Saskatchewan in 1991 (not shown in table) were $250 million; they were $389 million for Manitoba and $120 million for Alberta. In 2004, the number of farm manufacturers stood at 89 in Saskatchewan and at 83 in Manitoba, but no figures were available for value of shipments (sales). It is important to make the connection between the blacksmith shop and farm equipment manufacture, as it has often been said that the innovations and progressive ideas for machinery improvements largely came from farmers. John Schulte took over his father's blacksmith shop in 1938 and began to manufacture brush cutting equipment in 1942, later expanding into rock pickers. Leon Malinowski, who took over his father's blacksmith shop at Bankend in the 1950s, began to manufacture stock troughs, fuel stands, and tank stands. He incorporated as Leon Manufacturing in 1965 and moved to Yorkton in 1967; by 1989 he had 150 employees. One of the main problems for early manufacturing on farms was the lack of electricity, which prevented the use of welders. On the basis of research at the University of Saskatchewan concerning farm use of generators to produce electricity, Clem Roles modified war surplus generators that would power welders; with his partner Tom Smith, he formed Smith-Roles Ltd. to market the welder outfit. Following Rural Electrification, the company began to manufacture line welders, expanding several times its manufacturing field equipment; but in the late 1980s it went into receivership. In 1948 Peter Sakundiak formed Sakundiak Farm Equipment. Operating initially out of a small shop in Regina, he began manufacturing a disc harrow, but production was short-lived. In 1949 he made a grain auger that proved popular. He moved his manufacturing operations to the family farm in 1955, but in 1974 transferred operations to Regina and added a line of grain bins. In 1950 the Doepker brothers, starting with a garage and repair shop, expanded into manufacturing when Francis Doepker invented the harrow drawbar. They later added a rod weeder, harrow packer, drill and swather carriers. In 1952 Emerson and Kenneth Summach started Flexi-Coil Ltd. to manufacture a land packer that grew into a multi-product firm producing Air Seeders, tillage equipment, field sprayers, and harrow packer drawbars. As Canada's largest farm equipment manufacturing company, their equipment is sold worldwide. In 1997 New Holland acquired a 35% interest in Flexi-Coil. At St. Brieux, Bourgault Tillage Tools Ltd. began the manufacture of a four-row cultivator in 1969; after incorporation in 1973 they expanded into a full line of dual-purpose cultivators, and in 1985 they reorganized into a cultivator division and air seeder division. Wilfred Degelman manufactured rock pickers on his farm in 1963; in 1965 he incorporated and set up a plant in Regina, adding dozer blades, harrows, deep-tillage cultivators, and rock rakes. In 1975 Wilfred Wilger established Wilger Industries Ltd. in Saskatoon to manufacture farm field sprayers. There are two important organizations that serve the farm implement manufacturing industry in Saskatchewan, Alberta and Manitoba. The Prairie Implement Manufacturers Association (PIMA) was formed in 1970 with its current stated mandate to provide programs and activities that inform, educate, and transfer skills to Canadian manufacturers; George Morris of Morris Rod Weeder Company was its first president. To facilitate communication amongst members and to provide information PIMA first developed a newsletter, the Factory Action in 1973, then the PIMA Pulse in 1975, and in 1990 a quarterly magazine, the AgScene. PIMA was instrumental in initiating the Western Canada Farm Progress Show in 1978. The other important organization is the Prairie Agricultural Machinery Institute (PAMI), with offices in Humbolt, Saskatchewan. PAMI is an applied research, development and testing organization serving manufacturers and farmers with the resources needed to compete in domestic and world markets. Its services include design, development, fabrication and evaluation of vehicles, machinery, and components. In addition to these two organizations serving farmers and manufacturers, the Agricultural Implements Act regulates farm implement dealers to ensure that parts and service are available to farmers; the Act provides legal guidelines for warranties, sales contracts, emergency parts service, and compensation claims. Wetherell, D. and E. Corbet. 1993. Breaking New Ground. Saskatoon: Fifth House Publishers.